The Gold Ribbed Hare's Ear is one of the all time great effective classic patterns. It is a 'must have' fly in everyone's fly box. It is not an imitation of a particular insect but a general representation pattern that takes fish again and again and again. This is classified as a ‘Fancy’ pattern. I would not be without it. 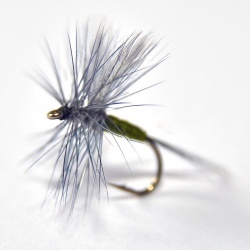 Years of experimenting have resulted in the general rule that a shaggy, scruffy hairy nymph is better at catching trout near the surface than a slim sleek nymph. Why is this so I hear you ask? Just think about what happens to a slim sleek bottom dwelling nymph as it floats to the surface just before it hatches. The water pressure decreases as the insect gets near the surface. Gases within the body expand. They bulk out its body inside its last nymph skin. This is the skin that it is about to shed. It looks bigger to the predatory trout. As the pressure of the water reduces its legs, gills, tail and head all swell. It's limbs are not capable of bending like they used to and now stick out. On the water surface it will have to fight to get through the surface tension to survive. The struggling and wriggling movement takes place inside the gas filled skin. Imagine that you are wearing a heavy diving suit the wrong way around and the zip was on your back. You are in the sea and you only had a couple of seconds to get out of the suit before you drowned. That is the sort of thing a hatching inset has to endure.